Most modern retail shelving is not specifically customized by the manufacturer, whereby a single piece is limited to a specific size, but it's not "one-size-fits-all," either. It's better than that. Buy basic retail shelving components and create adjustable shelving options that let you set up every shelving configuration you can think of – all with just a basic inventory of shelving units and fixtures that you can use again and again. You need adjustable shelving and fixtures to be truly successful in retail. Fully adjustable shelving – that which can be customized quickly to every need – allows you to create displays that are eye-catching, aesthetically pleasing, and will help you sell your merchandise. Just as importantly, though, you want that shelving to be versatile and changeable. You can do that with today's adjustable, modern shelving options. Many shelving options, such as staid, sturdy gondola shelves and their workhorse partners, end caps, have adjustable shelving in one-inch increments so that you can set heights instantly to accommodate different product sizes. Shelving types like gondola shelving and end caps allow you to keep shelves level, or tilt them up or down for best effect. While many shelving fixtures and components are made of sturdy, durable metal, you can also choose a different look by opting for shelves in glass, plastic or wood for a fresh new look. If you have a small retail space and don't need the heavy-duty qualities of standard gondola shelving, try slatwalls and floating shelves to boost product displays without taking up extensive floorspace. Floating shelves and slatwalls, which are made of thick wire mesh, can be put together as freestanding units or can be placed against the walls of your store. Slatwalls are grooved panels that allow you to install floating shelves anywhere on the panel; all you need to do is to slide them into the right slot. No brackets are needed, and you can change shelf positioning to accommodate differently sized products on display whenever you wish. 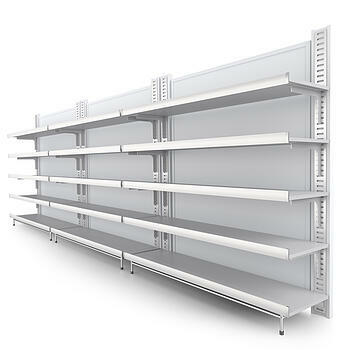 Shelving units with slatwall backs let you change up shelf positioning instantly. You don't need brackets, either, and you can also change out actual shelving for baskets, hooks, and other retail fixtures so that you can store and display even oddly shaped merchandise that may not fit on retail shelving. Self-service retail shelving works with gravity to keep items stored on shelves at the very forefront of those shelves. Customers can simply help themselves by removing the product from the very front of a given shelf; at that point, the item directly behind it will roll forward for easy access by the next customer. It's more convenient for the customer and keeps retail shelves neat without any extra work from you; just restock whenever you need to. Adjustable retail shelving allows you to create your own customized displays whenever you wish – with no need to spend a lot of money on single size, single use components. Instead, mix-and-match components; retail shelving of this sort has components that are meant to work together so that you can create unique configurations that will meet every display need you have. Don't worry about having to rebuy shelving components every year, either. These sturdy and interchangeable solutions are meant to serve your display needs for years to come.